Illinois guard Ayo Dosunmu (11) drives to the basket during the game against Evansville at State Farm Center on Thursday, Nov. 8, 2018. Illinois guard Andres Feliz (10) goes up for a layup during the game against Evansville at State Farm Center on Thursday, Nov. 8. 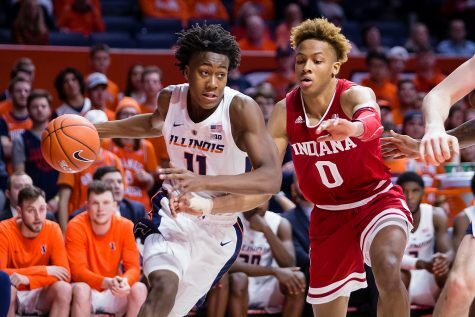 Much of the talk surrounding the Illinois basketball program during the offseason was about the impact five-star recruit and Illinois Mr. Basketball Ayo Dosunmu would make during his first season in Champaign. Dosunmu justified all of that talk against Evansville in the season-opener. He shot 8-of-14 from the field on the way to scoring 18 points and hauling in six rebounds to go along with four assists and three steals. It was a much-improved outing for Dosunmu, who scored 13 points and had four steals to five turnovers in an exhibition win over Illinois Wesleyan last week. 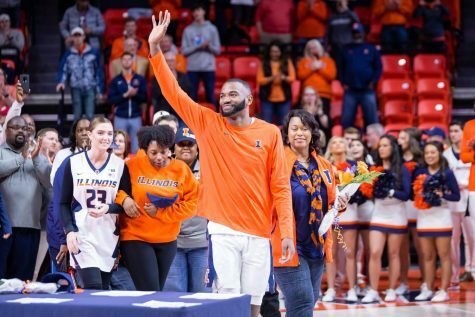 Dosunmu was glad to get his first real game as an Illini under his belt, though he admitted he was nervous. 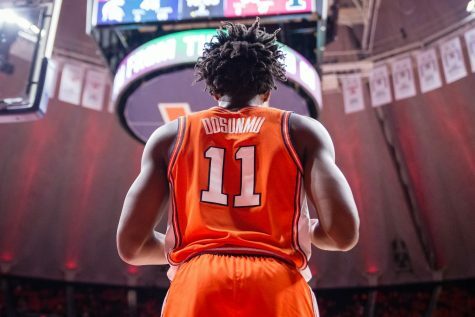 Second-year head coach Brad Underwood has sung praises of Dosunmu’s ability and character ever since he stepped foot on campus, but Thursday night it came to fruition on the court. 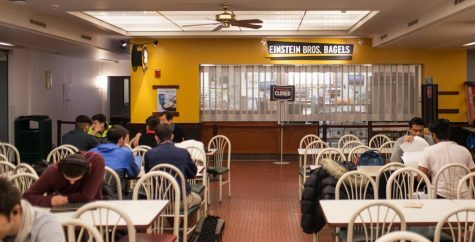 Underwood noted Dosunmu’s improvement on the defensive end from the preseason and the exhibition, crediting the freshman for lifting the team’s energy while defending the basket. Offensively, Dosunmu is a threat in many respects, though it was the Morgan Park grad’s defense that impressed him most. 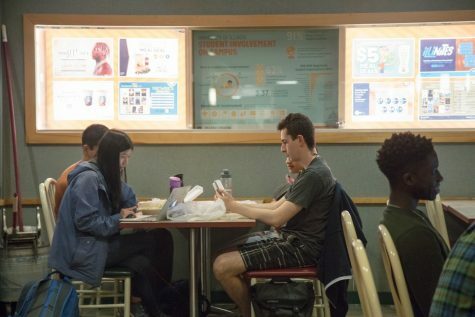 The Illini played fast on Thursday. 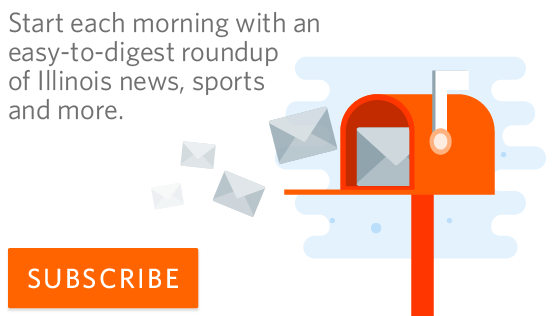 Far too fast for a less talented, less athletic Evansville squad to keep up — and it showed. 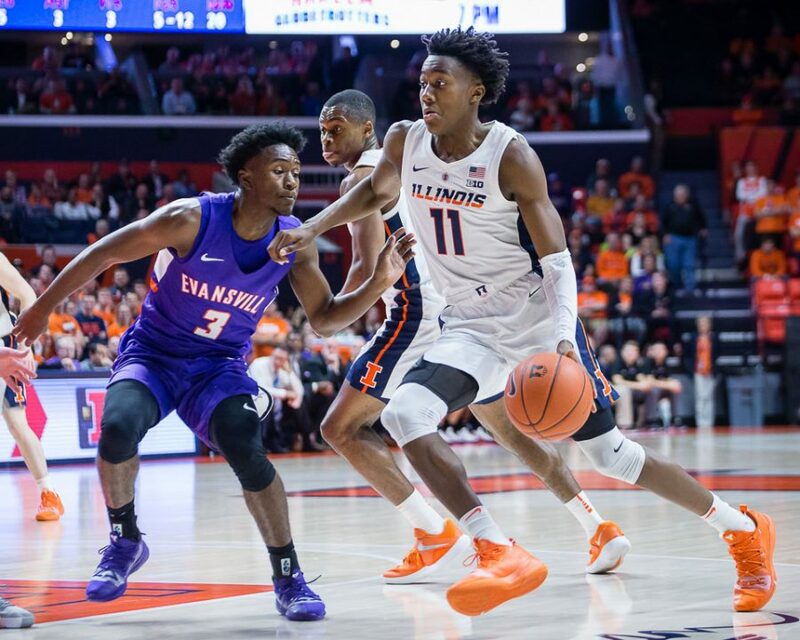 The Purple Aces kept things tight early in the game and even led briefly before the Illini raced out to 53 first-half points. 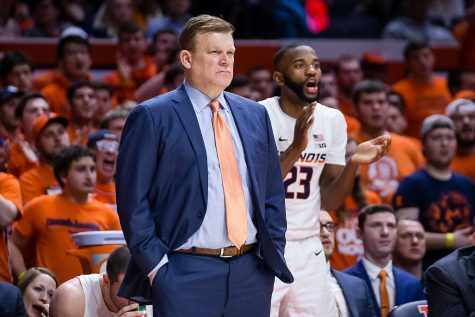 Illinois got to Evansville with a high-pressure defense, which meant the team was able to force an abundance of turnovers (22 total) and push up the court quickly for transition buckets. 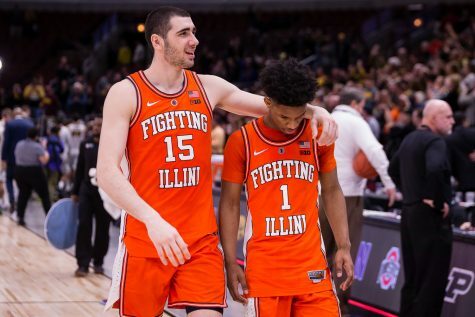 It seemed like each Illinois player had his moment, or several, on the break. 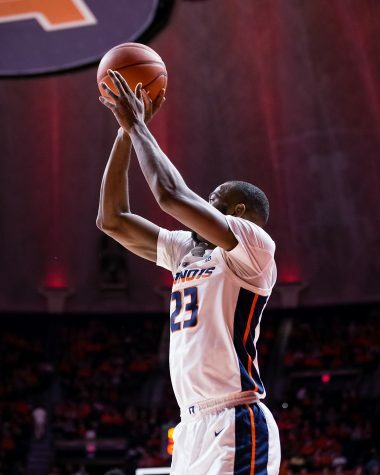 Dosunmu and sophomore guard Trent Frazier drove the tempo up to a speed too quick for Evansville and it created loads of open shot opportunities. 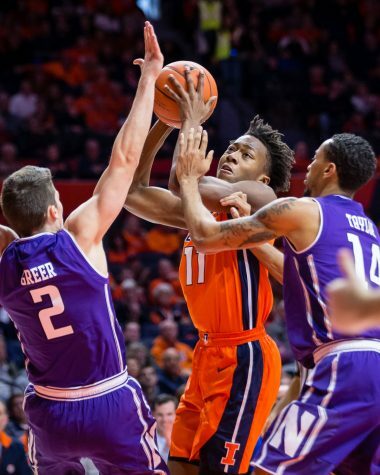 The Illini capitalized on the Purple Aces’ frequent mistakes offensively, scoring 32 points on turnovers. Jordan benefited directly, repeatedly floating to open space on the perimeter, where the Dosunmu and Frazier fed him the ball. When Evansville got back and rotated out to the perimeter, the Illinois guards simply drove to the rack themselves. And when Jordan got his chances, he converted, shooting 7-of-12 from the field and hitting five of his eight three-point attempts to lead the Illini in scoring with 19 points. 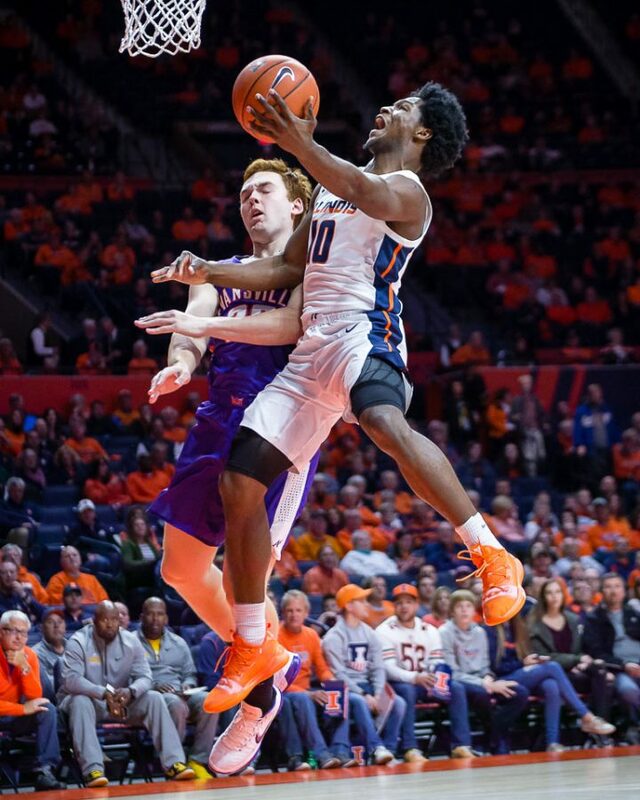 On top of Jordan and Dosunmu’s strong scoring nights, the Illini had plenty of juice to contribute on the offensive end, putting up 99 points. 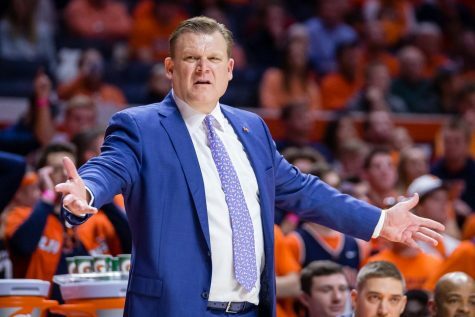 Illinois has only scored more points in a game once under Brad Underwood, totaling 102 points in the season-opener against Southern last season. Five players hit double figures, with No. 1 JUCO prospect Andres Feliz putting up 16 points, junior forward Kipper Nichols adding 13 and with Frazier adding 10 of his own. 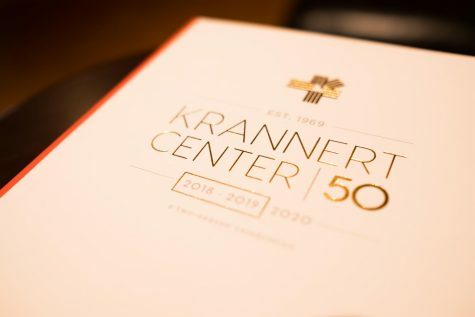 Freshman Tevian Jones went 3-of-6 from the field, scoring eight points (along with four rebounds, a block and a steal), while sophomore Da’Monte Williams had an impressive night, going 4-of-5 with three rebounds, three assists and a scintillating block on the perimeter in the second half. The Illini had scorers everywhere, a welcome change from last season when the team was forced to rely on Frazier to shoulder most of the scoring load, with Nichols occasionally breaking out for large outputs, but taking a lot of shots in the process. Underwood was mostly pleased with Feliz’s play, despite the junior’s five turnovers. The Guachupita, Dominican Republic native went 6-for-10, dishing out three assists, grabbing three rebounds and stealing the ball twice from the Purple Aces. Despite leading the team with 20 points against Wesleyan in the exhibition, Underwood didn’t start Feliz. 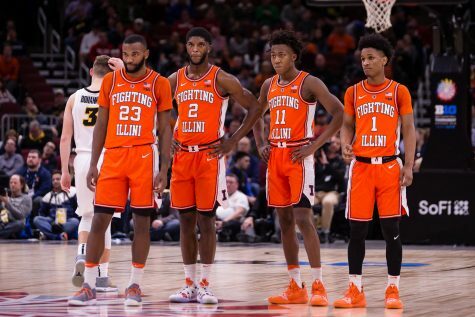 When Illinois wasn’t operating at a frantic pace on Thursday evening, they worked the ball around the perimeter and the paint quickly and with purpose. Illinois assisted on 22 of its baskets, a mark Underwood brought up during the postgame presser as something he was proud of. The team took its time when Evansville was able to get back to halt fast breaks, but it didn’t slow down in production. 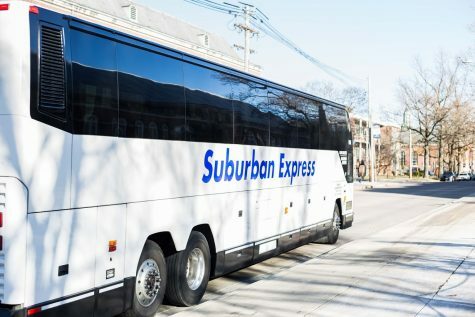 Out-rebounding Evanston 40-31, freshman forward Giorgi Bezhanishvili brought in a quarter of the team’s rebounds (10), and he also shot well from the field, going 3-for-5 for seven points. 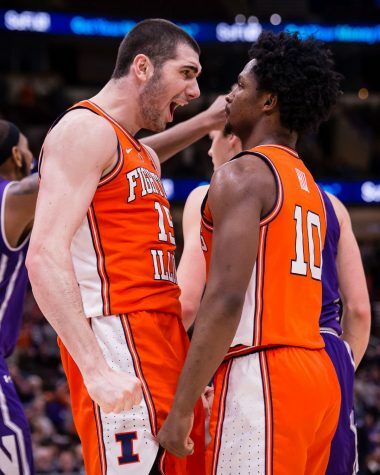 Bezhanishvili’s struggles to stay out of foul trouble in last week’s exhibition game felt like a distant memory, as he limited himself to just two fouls — none in the first half — including a technical foul for arguing with the officials. 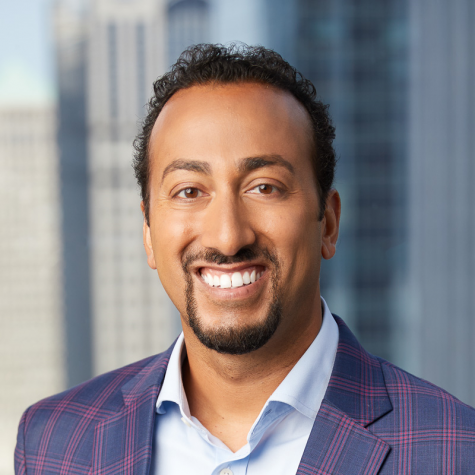 That helped Illinois execute with ease, feeding the ball to Bezhanishvili in the pinch post regularly, cutting and screening around him to open up shooters and late cut options. 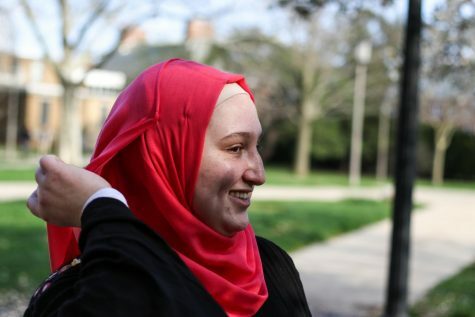 Collectively, Illinois performed well for not having faced such challenges in years. 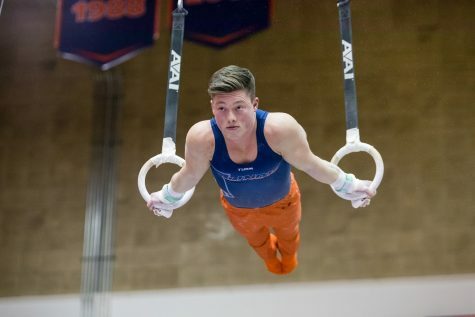 Illinois shot a stellar 56.3 percent from the field (40-of-71) and 42.9 percent from three-point range (12:25), while moving the ball well and accurately, only turning it over 14 times. 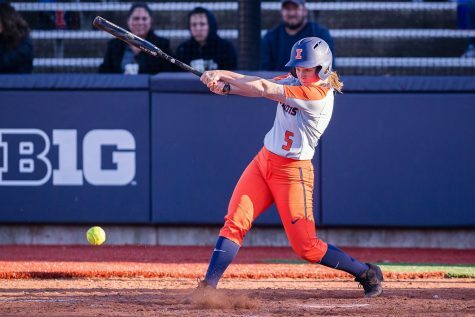 Illinois outmatched Evansville in every facet of the game. The true first test awaits this team on Tuesday night when Georgetown comes to the State Farm Center. If the Illini can maintain their balanced scoring, win the transition game and continue to move the ball well and create good opportunities in the half-court offense, they are not going to be an easy team to beat.